Greenleaf's New York Journal, and Patriotic Register (New York, NY), June 7, lists Ebenezer Purdy with 765 votes, William Barker, Jr. with 382 votes, John Robart with 341 votes, and Israel Underhill with 155 votes. 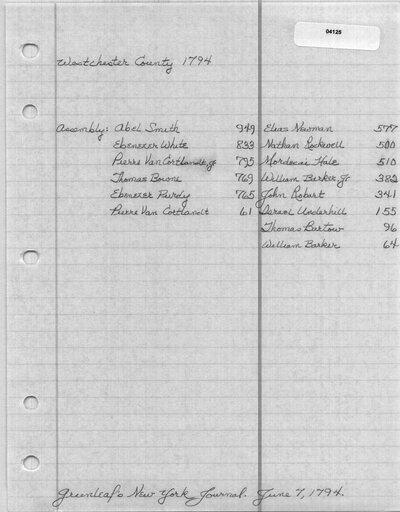 The Correspondence of the Van Cortlandt Family of Cortlandt Manor lists 793 votes for Pierre Van Cortlandt, Jr., 282 votes for William Barker, Jr., and 155 votes for Israel Underhill. Pierre Van Cortlandt, Jr. received 1 vote as Pierre Van Cortlandt. William Barker, Jr. received 7 votes as William Barker. Pierre Van Cortlandt, Jr. received 6 votes as Pierre Van Cortlandt. William Barker, Jr. received 2 votes as William Barker. William Barker, Jr. received 1 vote as William Barker. Pierre Van Cortlandt, Jr. received 2 votes as Pierre Van Cortlandt. Pierre Van Cortlandt, Jr. received 7 votes as Pierre Van Cortlandt. Pierre Van Cortlandt, Jr. received 4 votes as Pierre Van Cortlandt. William Barker, Jr. received 3 votes as William Barker. William Barker, Jr. received 77 votes as William Barker. Pierre Van Cortlandt, Jr. received 9 votes as Pierre Van Cortlandt. Greenleaf's New York Journal, and Patriotic Register (New York, NY). June 7, 1794. Judd, Jacob, ed. Correspondence of the Van Cortlandt Family of Cortlandt Manor, 1748-1800 Tarrytown, NY: Sleepy Hollow Restorations, 1977. 546-547.